Sarah Tate is a single mother living and working in Switzerland. She arrived in Switzerland ten years ago and apart from a brief stay in France, has remained ever since, as Switzerland has become her adopted homeland. 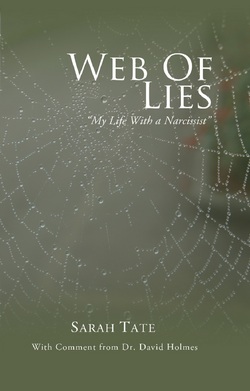 Sarah has three young kids, who take up most of her time, but she still managed to find time to write her first book 'Web of Lies - My life with a Narcissist'. The book is an auto-biographical novel which describes in graphic details, the ups and downs of life with a person who suffers from (amongst other things) Narcissistic Personality Disorder. Renaissance begins with the end of a six year marriage. Sarah suddenly finds herself facing divorce, debt, and a future as a single mum-of-three. This certainly wasn’t how she had planned life all those years ago when she first met her ‘dream man’. Unfortunately, that dream had quickly turned into a nightmare, and now Sarah was deal with the fallout. Renaissance picks up Sarah’s story as she deals with the final stages of a toxic relationship. Despite it seeming as though her world has collapsed, Sarah is able to escape and close the door on her ex. With the help of family, friends, and therapy, she learns to look inside herself and find an inner strength she didn’t know she had. Describing the highs and lows of life as a single mum in Switzerland, Renaissance details Sarah’s journey back to normality. As she finds solace through her therapist, she begins to learn the true nature of what she has been up against all these years, and as she arms herself with knowledge, she is slowly able to come to terms with what happened, regain her strength, and finally move on. Renaissance is a must read for anybody who’s found themselves in the position of having to re-build their lives from scratch following the breakdown of a toxic relationship.